BRYAN EATON/Staff photo. 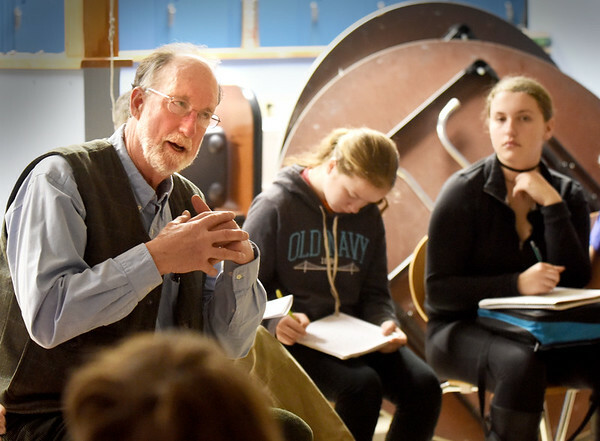 Frank Garrison, of Gloucester, and the great-great-grandson of Newburyport-born abolitionist William Lloyd Garrison, speaks to River Valley Charter School students in a round-table discussion on human rights as they have been studying the elder Garrison in units on the HIstory of Race, Gender and Activism. The middle school students, along with Pentucket High School students, last year were lobbying for the second span of the Whittier Bridge to be named after Garrison, a friend of John Greenleaf Whittier.